My idea for the BALANCING ACT was that there be a larger images (the figures in the foreground, the clown on the side, the audience in the background) which can be seen from a distance. I also wanted the viewer to be able to go up close and see many small details, drawings, and ornamentation that would give the sense of a delicate miniature. 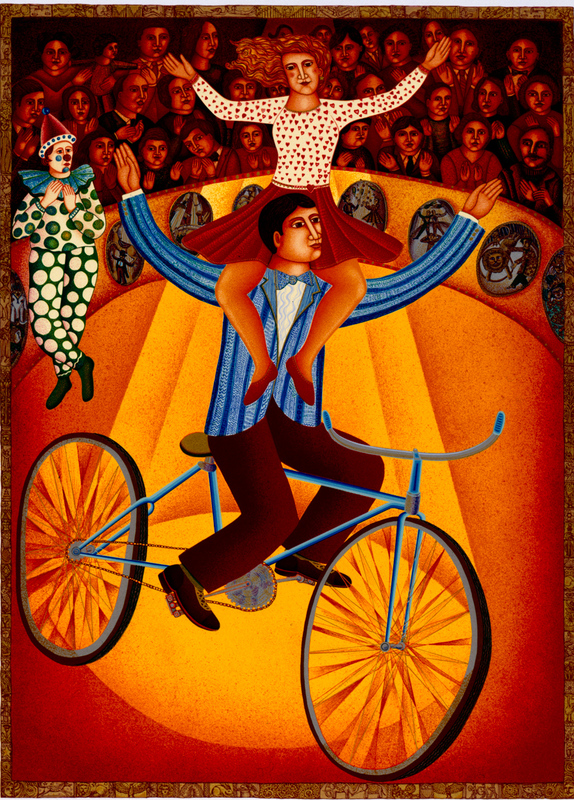 This circus act fascinates me, two people on a bicycle, balancing each other. We, as spectators are thrilled at their daring and grace. The performers have their confidence, they have practiced, worked on this with such discipline and care. They want us to feel the ease and joy of this performance. They want us to feel we are on the bicycle. The clown stands on the side ready to jump in if things get shaky, the clown will help us laugh if anything goes wrong. The clown is our mirror to understand and set us free from fear and having panic or paralysis of spirit. If something goes wrong the agile performers jump back on and try again. They know it is not easy, it is their discipline. An original, hand-printed serigraph published by the artist with collaboration of master printer James F. Butterfield II at Aurora Serigraphic Studio, Van Nuys, California. Dimensions: Image: 20" x 28"